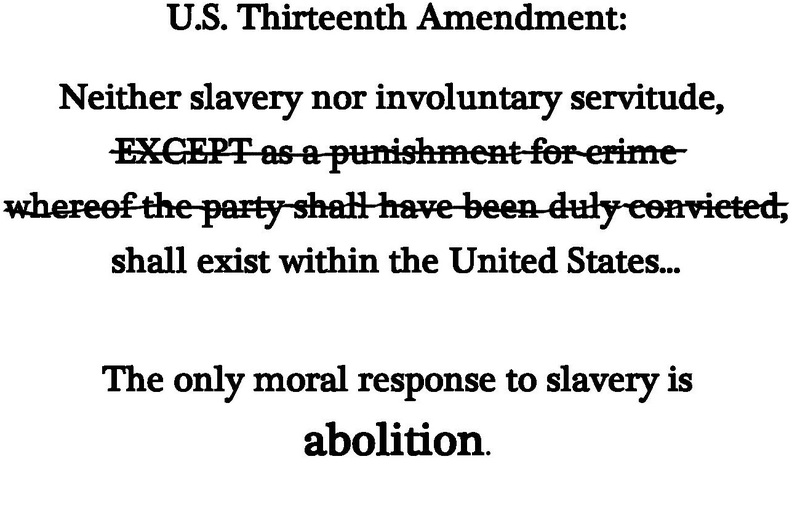 Abolition of all private prisons—No Exceptions believes there should be no exceptions to the abolition of slavery. People should not profit off the custody, confinement, and control of other humans. Private prisons do just this in our society. Some systems cannot be reformed; they must be stopped. Private prison property and profit is acquired through the ill-gotten gains of slavery, torture, trauma, and death. Through legislation, lobbying, and targeted direct actions, we aim to eliminate the four private prisons in Tennessee and the corporations that back them. For more, click here. We work to achieve these ends through education, legislation, litigation, and organizing. We aim to function as an organizing arm for the families of Tennessee prisoners, as well as mobilize other collaborators and sister organizations toward the fruition of our goals. Through popular education in faith-based communities, universities, and schools, we seek to educate and engage the broader community in dialogue on the realities of mass incarceration, the inevitability of change, and the possibilities of creating alternative paradigms.